Non Medical Register publications Results? DHARMAPURI. 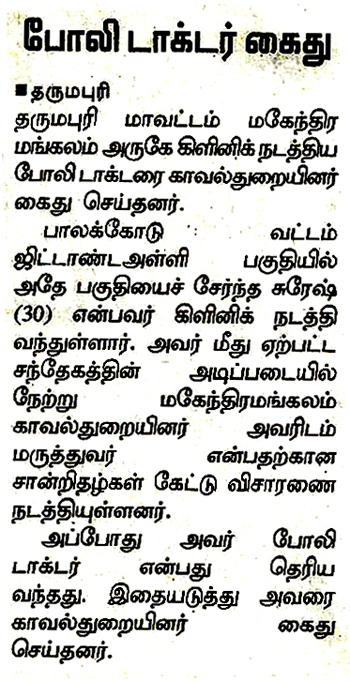 JUL: The Police arrested Dr Suresh, a fresh BHMS doctor practicing at Mahendramangalam at Dharmapuri District. The facts are alleged on doubtful certificates and professional enmity. Non availability of the Medical Register particulars in collectorate level results bad experience for the fresh BHMS physicians too. Homoeopathy system has its council there were about 15.176 practitioners in B and C Class and around 4,500 in A class . The council keeps the old Medical Register which published in 1978 for B and C. The Medical Register for A is published once in a while. According to the council act, it is duty of the registrar to publish the Medical Register every year in the month of February and send to collectors and Corporation commissioners to furnish the professional information about every practitioners and any death.